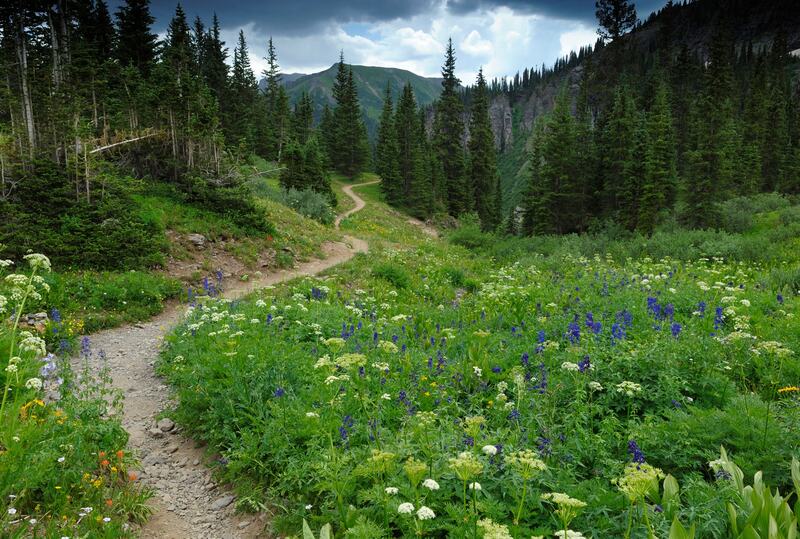 Healthy forests are essential for a healthy Colorado. Forest health depends on a stable climate and robust ecosystems. The Forest Health Index (FHI) tracks these conditions for 38 forested watersheds across Colorado. 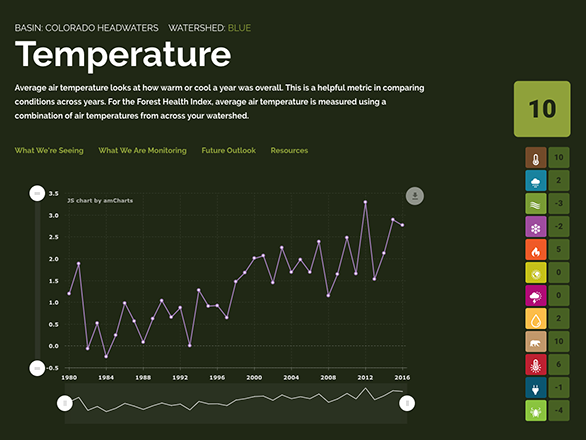 We monitor 12 indicators of forest health, such as temperature, precipitation, and fire risk. Each year we compare present and historic conditions. We assign each indicator a score based on how much current conditions differ from the past. We invite you to find your watershed and see how conditions have changed over the past 40 years. Our forest is the dominant feature of our local landscape—it defines the character of our local ecosystems as well as human communities in the area. Forest health, in large part, equates to environmental health. As a result, the indicators we look at include a broad range of physical environmental indicators, such as climatic and ecological measurements, as well as records on human activity and management practices in and around the forest. The indicators we have selected include drivers of change and the effects of those changes on the forest ecosystem and neighboring human community. Forest health equates to environmental health. To measure change the Forest Health Index (FHI) scores each indicator on a scale of -10 to 10. A score of 0 means that the indicator matches its historic average. Negative scores mean an indicator is below its historic average, and positive scores indicate that it’s above. As we all know there is seldom a year when anything is perfectly average. A score in this range is extremely unusual if not unheard of in the historic record. Even a single year of these conditions can cause extreme stress for many species. Scores in this range show that an indicator is unusually low but not unheard of. These conditions especially year after year can stress some species. This is the normal range of an indicator. Forests are well adapted to these conditions. Scores in this range show that an indicator is unusually high but not unheard of. These conditions especially year after year can stress some species. A score in this range is extremely unusual if not unheard of in the historic record. Even a single year can cause extreme stress for many species.